Flash Crash Spoofer Aids CFTC in Finding Other Spoofers, Which Include Big Banks and People Who Served on the CFTC’s Technology Advisory Committee. Wait What? Browse: Home » 2018 » January » Flash Crash Spoofer Aids CFTC in Finding Other Spoofers, Which Include Big Banks and People Who Served on the CFTC’s Technology Advisory Committee. Wait What? We know the CME has always been a staunch defender of their exchange but this statement is bordering on laughable. The CME has long claimed there vertical silo market is superior to the fragmented equity market but they allowed this level of spoofing to continue for years. We would think that spoofers are much easier to spot in vertical silos as opposed to the fragmented equity markets. We think the CME has some explaining to do. Deutsche Bank. $30 million fine for spoofing. $15 million fine for spoofing, and “trading in a manner to trigger customer stop-loss orders”. $1.6 million fine for spoofing. Jitesh Thakkar & Edge Financial Technologies for spoofing, and selling spoofing systems. When the CFTC put the blame for the Flash Crash on a UK man living in his parent’s basement, we expressed concern that spoofing behavior was more institutionalized, and not confined to any lone wolf like Sarao. We were right, as Deutche Bank, UBS, and HSBC demonstrate. Thakkar was in cahoots with Navinder Sarao. They were spoofing together, and emailing each other discussing their tactics. Prosecutors labeled Thakkar Sarao’s co-conspirator for developing the program that enabled Sarao to spoof the S&P e-mini futures on the CME, as well as for spoofing himself. 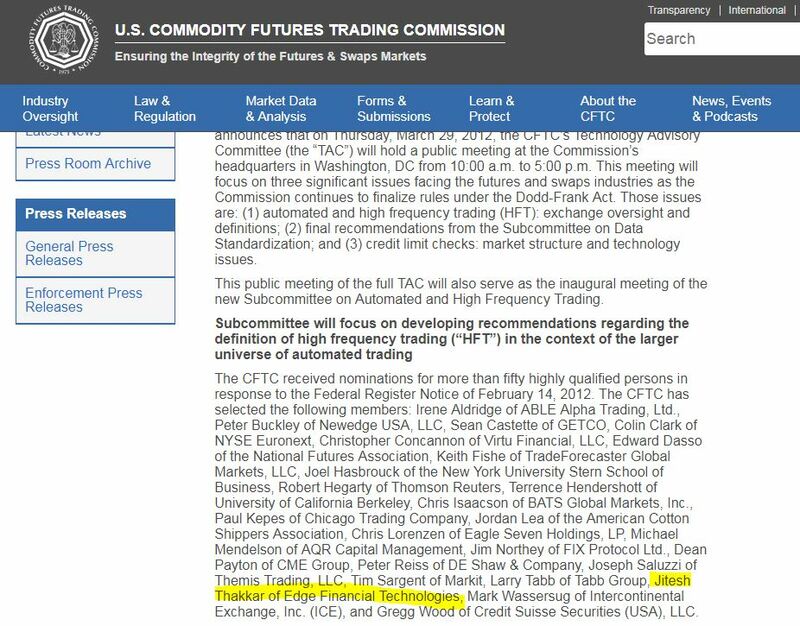 Thakkar was invited onto, and served on the CFTC’s Technology Advisory Committee (TAC), and was a member of the subcommittee on Automated and High Frequency Trading! You may recall that our own Joe Saluzzi served on that committee. The members had to be nominated to the CFTC first. 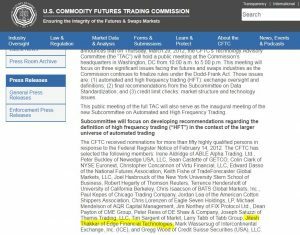 Who nominated Thakkar to the CFTC? It seems the CFTC needs to answer that question. And it seems the CFTC needs to look at who Edge Financial’ s clients are! PS Joe publicly dissented when that committee defined HFT too broadly – so that it would capture buyside long-only trades. 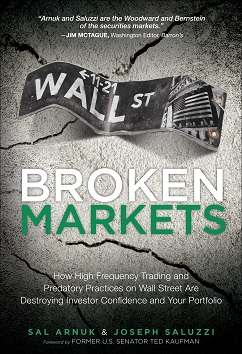 Thakkar and others would not accept that HFT was a two-sided activity, which Joe argued. The next time you hear industry pundits and status quo defenders of our market structure label critics with tin foil hats for claiming the markets are rigged, remind yourselves that Nanex’s Hunsader caught Sarao’s specific activity just weeks after the Flash Crash. Remind yourselves that the Regulators regularly rely on Bad Actors to serve on their Sub Committees. And make policy. And that they even go to work for very high speed firms they are supposed to be overseeing. Remind yourselves that the CFTC fired economist Andre Kirilenko after he correctly studied and concluded that the Flash Crash was not caused by a midwestern mutual fund. Remind yourselves that a current SEC Commissioner STILL gives speeches labeling Flash Boys as a work of fiction. Maybe the regulators who make policy to protect investors and market integrity need to stop relying on the input and counsel of the same industry insiders intent on keeping the game rigged. ← It’s Not A Rebate!